when Art French, a local newspaper photographer, first opened a storefront photography studio in the big corner window of the venerable Frederick & Nelson department store. 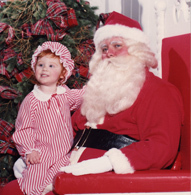 Credited with being the first photographer to boost small tots onto Santa’s knee for the annual, commemorative portrait, Mr. French memorialized this Christmas moment over the next 20 years. In 1962, after Mr. French’s passing, the Viydo family purchased the Santa Photography business and set out to build what has become the longest-running Christmas tradition in the country. And like the long tradition that preceded its current ownership, Arthur & Associates is committed to keeping the magic and mystery of Santa alive. Having operated Santa Photo programs for the former Frederick & Nelson department stores for nearly 30 years, Arthur & Associates currently provides both Santa and Easter Bunny photography for a variety of malls, department stores and communities – now serving third and fourth generation visitors. What makes this tradition and this company unique in the holiday photography business is the timeless devotion to quality and customer satisfaction. Each year, the wishes and smiles are different and uniquely special. The family owned company remains proudly committed to the quality of the experience and photograph that captures memories to last a lifetime…year after year.